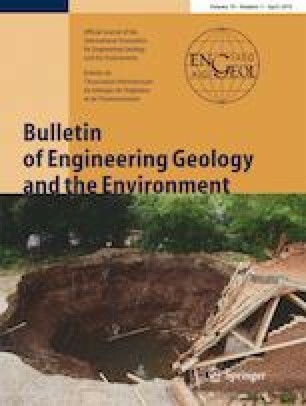 In this study, density, porosity, void ratio, and ultrasonic P- and S-wave first arrival times were measured on limestone, sandstone, and siltstone samples obtained by using mechanical soundings in the city of Zonguldak. Turkey. Fracture and fissure indexes of rocks were calculated from ultrasonic P- (Vp) and S-wave (Vs) velocities. Multi-parameter relationships occurred between ultrasonic velocities with seismic fracture and fissure indexes and physical and mechanical properties of the rocks. Root mean squared error (RMSE = 0.5–0.8%) values correlated between measured densities and densities calculated from Vp and Vs. The correlation coefficients of experimental relations between densities, void ratio, and porosity with seismic velocities that were obtained ranged from 78, 86, 67, and 84%, respectively. Consequently, natural, water-saturated and grain densities, porosity, and void ratio values were determined from new multi-parameter relationships obtained from the combined use of Vp and Vs. In addition, the results of this study suggest that the rock quality may wrongly be determined using the only Vp, whereas it can be obtained more accurately by using Vp and Vs together. The reason for this is that the P wave spreads in solid, liquid, and gas media, while the S-wave spreads only in solid media. Therefore, S-waves will not be altered by fracture filling (gas or liquid), while P-waves are affected by fracture filling. In the present study, the use of Vp and Vs together in relationships was more useful in determining the strength and hydraulic properties of rock mass that the use of either Vp or Vs alone. Also, Rock Quality Designation (RQD) and Rock Mass Rating (RMR) values can be correctly calculated from the combined use of Vp and Vs. As a result, interpretation of crack fill and classification of the rocks can be quickly performed using seismic velocities. Altındağ R (2012) Correlation between P-wave velocity and some mechanical properties for sedimentary rocks. J South Afr Inst Min Metall 112(3):229–237. Chary KB, Sarma LP, Lakshmi KJP, Vıjayakumar NA, Lakshmi VN, Rao MVMS (2006) Evaluation of engineering properties of rock using ultrasonic pulse velocity and uniaxial compressive strength. In: Rao MVMS (ed) Proc National Seminar on Non-Destructive Evaluation. Published by Indian Society for Non-Destructive Testing Hyderabad, Hyderabad, pp 379–385. Christaras B, Mariolakos I, Foundoulis J, Athanasias S, Dimitriou A (1997) Geotechnical input for the protection of some Macedonian tombs in Greece. In: Moropoulou A, Zezza F, Kollias E, Papachristodoulou I (eds) Proc The 6th Int Symp Conservation of Monuments in the Mediterranean Basin. Published by Technical Chamber of Greece, Rhodes, pp 125–132. Çobanoğlu I, Çelik SB (2008) Estimation of uniaxial compressive strength from point load strength, Schmidt hardness and P-wave velocity. Bull Eng Geol Environ 67:491–498. Göktan RM (1988) Theoretical and practical analysis of rock rippability. PhD thesis. Istanbul Technical University, Istanbul (in Turkish). Kahraman S (2001) Evaluation of simple methods for assessing the uniaxial compressive strength of rock. Int J Rock Mech Min Sci 38:981–994. Kılıç A, Teymen A (2008) Determination of mechanical properties of rocks using simple methods. Bull Eng Geol Environ 67:237–244. Sousa LMO, Rıo LMS, Calleja L, Argandona VGR, Rey AR (2005) Influence of microfractures and porosity on the physico-mechanical properties and weathering of ornamental granites. Eng Geol 77:153–168. Tercan AE, Ünver B, Tiryaki B, Özbilgin D (2005) A study of relationships among mechanical, index and petrographic properties of some sandstones using canonical correlation analysis (in Turkish). Mining 44:3–14. Tugrul A, Zarif H (1999) Correlation of mineralogical and textural characteristics with engineering properties of selected granitic rocks from Turkey. Eng Geol 51(4):303–317. Vasconcelos G, Lourenço PB, Alves CAS, Pamplona J (2008) Ultrasonic evaluation of the physical and mechanical properties of granites. Ultrasonics 48:453–466. Yaşar E, Erdoğan Y (2004) Correlating sound velocity with the density, compressive strength and Young’s modulus of carbonate rocks. Int J Rock Mech Min Sci 41:871. Yaşar E, Erdoğan Y (2003) Yapı-kaplama kayalarının P dalga hızı ile fiziko-mekanik özellikleri arasındaki ilişkilerin istatiksel analizi, Türkiye IV. In: Ersoy M (ed) Marble Symposium (Mersem’2003). Published by TMMOB Maden Mühendisleri Odası, pp 353–362 (in Turkish). Zukui L, Xinxu Z, Jinhai Z, Daixu T, Yongsong T, Jing Y, Yanqing L (2001) The experiment investigation of the correlation of acoustic logging and rock mechanical and engineering characteristics. In: Sijing W, Bingiun F, Zangkui L (eds) Frontiers of rock mechanics and sustainable development in the 21st Century. Published by CRC press, pp 89–92.